Juddmonte's Enable made history on Saturday as the first horse to win both the Arc de Triomphe and the Breeders' Cup Turf in the same season, but the 4-year-old daughter of Nathaniel did not find it easy in either start. She won the Arc by 2 1/2 lengths in 2017, but an injury early in 2018 had her making this year's Arc just her second start of the season. Enable managed to hold off Sea of Class by a short neck to defend her title, and she had another tough test beneath the Twin Spires at Churchill Downs. 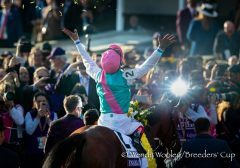 Two days of rain during the week leading up to the Breeders' Cup had the turf course quite soft, and though jockey Frankie Dettori had galloped her on it Wednesday through Friday, Enable still struggled with the course through most of the 1 1/2-mile contest. “I was a bit further back than I wanted to be,” Dettori said of the early part of the race, when Enable was as far back as seventh in the 14-horse field. “From the bend to the back straight, I was four-wide. I felt that the ground was much worse on the inside, but I didn't have the novelty to be wide with the draw. I was drawn two, and she didn't break that well. Then the pace was on straightaway. I was trying to get off the fence. But was still quite kind of pinned on the fence coming into the first turn. Magical, trained by Aidan O'Brien and ridden by Ryan Moore, is notorious for liking soft ground and was entering the Turf off a win in the QIPCO British Champions Fillies & Mares Stakes. 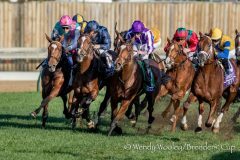 She was immediately to Enable's inside as the two went very wide around the far turn, and the battle was on between them through the length of the stretch; they wound up nine lengths clear of third-place finisher Sadler's Joy. “When I asked, 'C'mon, baby, let's go,' she went half a length up,” Dettori relayed. “(She) also ran with some difficulties. I knew then she was fighting for me. But Ryan (Moore, on Magical) was like a wasp, wasn't going away, was always there. “Magical, she's a duck in water in these kind of conditions. She's a tough nut to crack. Two great fillies. Yeah, obviously (Enable) was fitter in the Arc, but conditions made it a bit difficult. Enable finished three-quarters of a length ahead of Magical on the line. Asked immediately after the race if Enable would race for another season, racing manager Lord Teddy Grimthorpe did not have an answer. Both Dettori and trainer John Gosden were clearly enthusiastic about the idea of going for a third Arc run, of course. 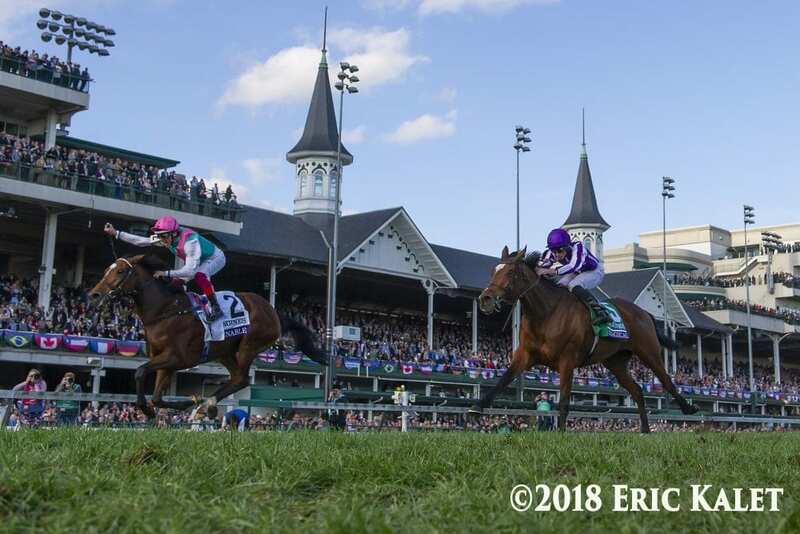 This entry was posted in Breeders' Cup, NL Article and tagged arc de triomphe, Breeders' Cup, breeders' cup turf, churchill downs, enable, frankie dettori, john gosden, juddmonte, lord teddy grimthorpe, magical, nathaniel, sea of class, teddy grimthorpe by Chelsea Hackbarth. Bookmark the permalink.